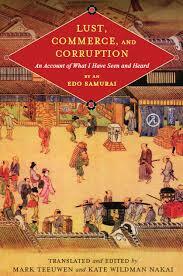 A firsthand account of vice and profit in Edo – Book review. Riding the circular Yamanote Line on a Sunday in Tokyo, it is easy to daydream. Those who have found themselves at times wondering what the city might have been like in the past are likely to enjoy the aptly named “Lust, Commerce, and Corruption: An Account of What I Have Seen and Heard, by an Edo Samurai,” a well-translated firsthand account of life in Japan’s capital 200 years ago, when it was the burgeoning city of Edo. By selecting it as the seat of his power in 1603, Shogun Tokugawa Ieyasu raised Edo from rural backwater to de facto national capital. Its ascension was swift, and the population nearly tripled in the century following the year 1650. By the time this book was written in 1816 by an anonymous samurai calling himself Buyo Inshi, Edo had nearly twice as many denizens as Paris. In his account, Buyo pulls back the curtain on a diorama of Edo with an acerbic social critique that seeks in its roughly 400 pages to leave no stone unturned. Beginning with warriors and farmers, he moves on to temple and shrine clergy, doctors, the guild of the blind, townspeople, rice agents, prostitutes, brothel keepers, actors, outcasts and more, outlining the position of each group within the larger society. Among the many social issues of his day, Buyo examines closely the culture of rampant litigation and the ways that townspeople leveraged lawsuits to gain advantage over warriors. The population drain from the provinces to the cities is also discussed, along with the impact of kabuki and prostitution, and a great many other elements of Edo life. Besides being a fascinatingly detailed look into the culture and fashion of the times, Buyo’s writing is also an examination of the effects of free enterprise unchained in an era of peace. He exhaustively sets down the frivolity and conspicuous wealth that become available in large cities such as Edo, and the underbelly that always attends such excess: crime, usury and the singular pursuit of profit. A good deal of this book’s charm stems from its author’s fallibility. Buyo is prone to blanket statements, is often corrected by the book’s editors on his facts (especially those concerning the provinces) and not infrequently misremembers his quotes from the Chinese classics and other sources. Buyo’s penchant for repetition and nostalgia confirm him as the type who walked to school and back uphill both ways in his youth. As a scholarly text, “Lust, Commerce, and Corruption” is superior. Included in the useful apparatus are notes on currency and measure, and a map of Edo showing warrior and townspeople residential areas and temple grounds. A 30-page introductory essay by the editors, “Buyo Inshi and his Times,” is a lucid, comprehensive beacon that sheds light on the groups Buyo deals with as well as his historical perspective. The editors’ description of Buyo’s language as being “far from sophisticated” is borne out by an extremely thorough translation that sustains his workmanlike voice, a remarkable feat given that it is the work of no fewer than five experts. Despite its length, “Lust, Commerce, and Corruption” is consistently engaging, thanks in part to the clarification provided by extensively researched footnotes. This book is as valuable for its preservation of the unique opinions of the author as it is for the myriad historical facts and details it brings to the fore. Considering the energy that Buyo put into this long account, one can only imagine his despair upon learning that the roots of the problems he outlines are not specific to Edo in the Bunka Era (1804-18), as he seems to imagine, but rather to the human condition throughout time. Book review by TYLER ROTHMAR and the Japan Times.